Oops they did it again…. 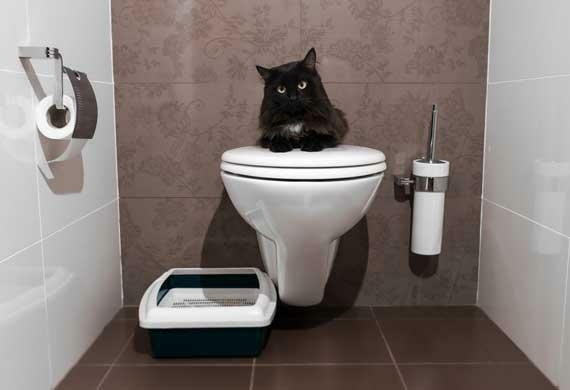 Problem pee-ers are all too common in the feline world and living with one can be frustrating to say the least! Anyone who has ever found cat pee somewhere it shouldn’t be can vouch for how hard it is to clean and the stress of coming home to the uncertainty of where the next wee will be! Cats can decide to toilet outside the tray for a number of reasons. Often it requires a behavioural consultation to figure out why they are not toileting where they are meant to. However, in the mean time there are a number of great tips that can help make the litter boxes appealing as possible to your furry friend! For some cats sofas become their chosen toilets! Most (not all) cats prefer uncovered Lots of them feel anxious in the enclosed box with only one escape hole. Most cats would choose a tray 1.5x the length of the cat; trays that are too small prevent their normal urinating routines. Cats are fussy, so the tray should be CLEAN at all times! Urine and faeces should be removed asap (ideally as soon as it has been done). Wash the tray with hot water at last once a week and avoid chemicals that can be aversive (at best) or even toxic. Avoid litter liners. Although they make our lives easier, they often catch on a cat’s claws which can put then off entering the tray! Make sure the tray is away from the cat’s food and water and in a quiet location…. Nobody likes to pee with people watching! Give your cat an option of cat litter and avoid changing the litter type if possible. Some cats have a real preference as to what they pee on. Make sure there are enough trays in multi cat house holds, as a general rule of thumb AT LEAST one tray per cat and a spare in different locations of the house. Not all inappropriate toileting is behavioural, always make sure you get a vet to check your cat if it starts to pee in strange places. Urinary tract infections, stones, cystitis and other medical issues can often show up as urinary issues. 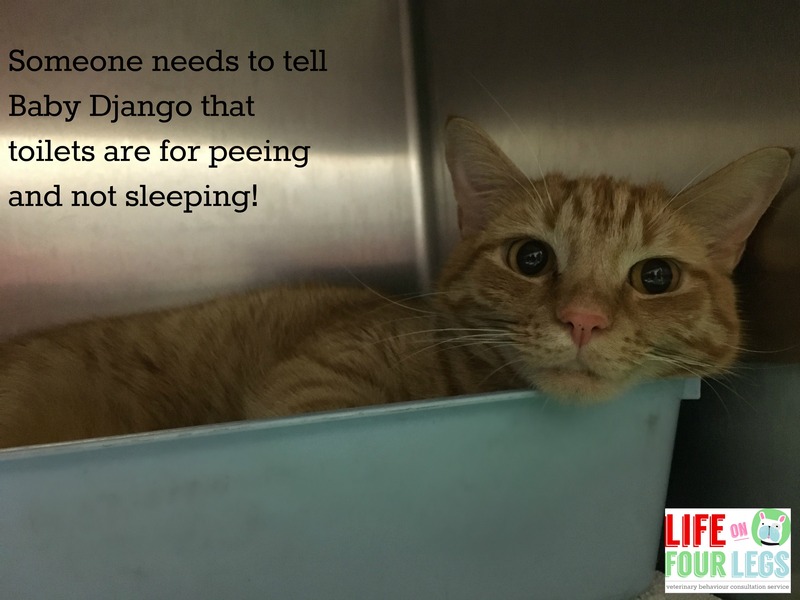 If your vet has checked out your cat, you have tried all the litter box top tips and your cat is continuing to pee in strange places then feel free to call Dr Julie @ Life on Four Legs (or any other veterinary behaviourist). Often the sooner we can have an appointment the easier these problems are to sort! Cats – are they social butterflies or lone wolves? Are two cats always better than one? Or are cats simply antisocial loners that will fight if kept together? 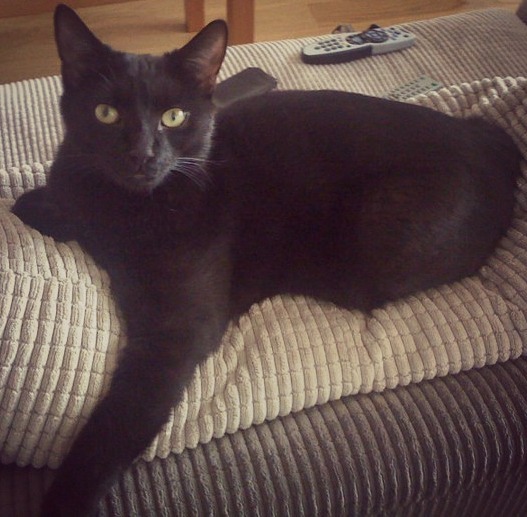 There are so many myths about the mysterious lives of our feline friends that in this blog I thought I would look at what is really going on!!!! How do feral cats live? To discover how our domestic felines should be kept we can start by looking at their feral counterparts. Feral cats can form huge colonies of animals. Within these colonies there are generally smaller social groups consisting of related females (sisters, mums, aunties), that co-rear their young (even going as far as nursing other queen’s kittens). The males are not quite the socialites that the females are and tend to live on the edges of the groups as loners and will (just like a Friday night in Kings Cross) fight with other males to compete for mates. Related female feral cats often rear their young together. The number of cats living in a certain area will depend on the amount of resources available to share, most importantly food. If food & den areas are plentiful then huge numbers of cats can live alongside each other quite happily. 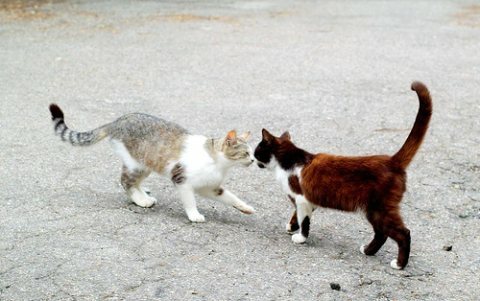 However as the numbers of cats increase (and they do very quickly as cats are prolific breeders) squabbles break out and cats are forced out and so the groups can be quite changeable. What about our domestic cats? So most of our domestic cats are much more pampered than their feral counterparts. Large numbers of cats, male and female both related and unrelated can often live quite happily with each other and be very social. However having a cat living in the same house is a cause of anxiety for many of our feline friends, which can often go unnoticed until fights break out. How can I tell if my cats are BFFs? Cats that are greeting each other with their tails up are happy to see each other, a sure sign they are probably friends! Allogrooming, simply means grooming each other. Cats that see each other as the same social group will groom each other. This may be a way of increasing their bond, or simply a way of cleaning an area that is hard to reach for a friend! (Like putting suncream on someone’s back!). 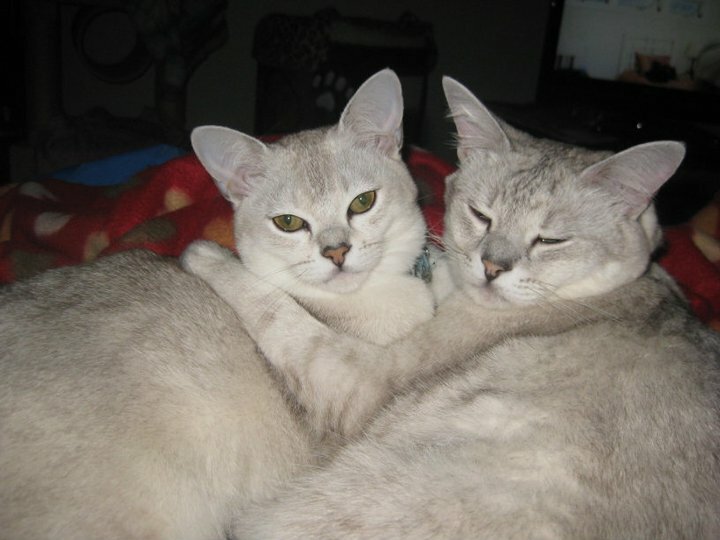 Interestingly in some studies cats often groom each other more after a fight, so it also might be a way of saying sorry and making friends. Allorubbing, simply means rubbing on each other. This is an act many cat owners will be familiar with, as this is something cats often do to your legs when you arrive home. This is likely to impart a ‘family’ odour to the group, so that all members are easily identified as well as being a tactile affirmation of friendship (a cat’s idea of a hug). Cats that eat and sleep together are often close friends (like their human counterparts! ), as during both these activities a cat could be vulnerable to attack. 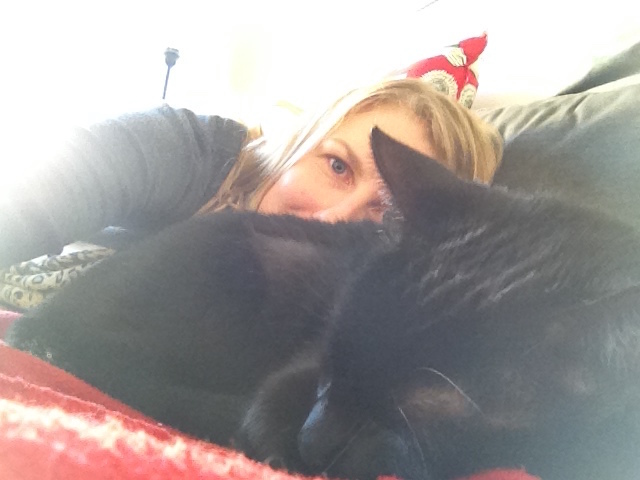 OK, OK I know I am not a cat….but here is Sebastian the wonder cat and his best friend (me) taking a nana nap! 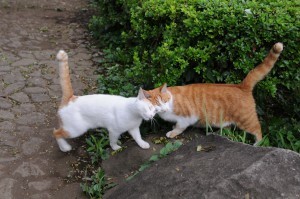 Avoidance – cats that avoid each other at all costs – e.g. one enters the room and the other immediately leaves. Always make sure you provide enough resources (litter trays, food bowls, resting places etc.) in different locations around the house. 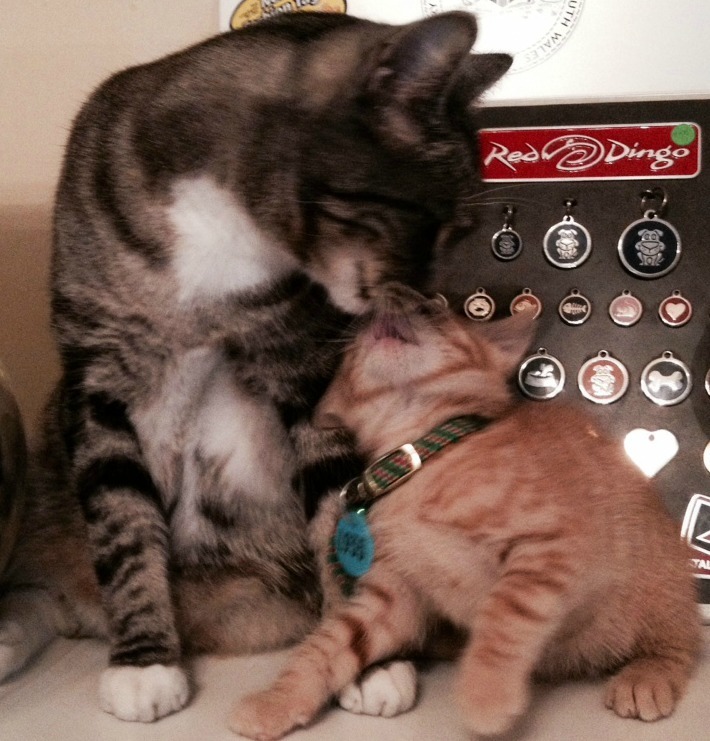 This will reduce the need for competition between family felines. Feliway is also always a great idea if you feel that two cats are not getting on as well as you would hope. 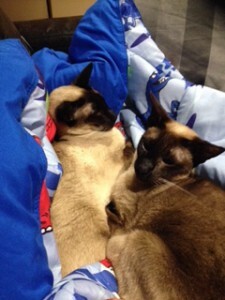 Sami and Zabeel don’t need two beds – but most multi-cat households will. Relationships between cats can be complicated, so if you feel your cats are having problems please seek help early from your Veterinarian or a qualified Behaviourist. Dr Julie is a qualified Veterinarian and Veterinary Behaviourist, she runs Life on Four Legs – a dog and cat behaviour clinic based in Sydney, NSW.